Fighting continued in the rebel-held Eastern Ghouta area of Syria during the first daily five-hour "pause" ordered by the government's ally Russia. Activists said there were government air and artillery strikes, while Russia said rebels had shelled a "humanitarian corridor" meant to let civilians leave. As a result, there were no UN aid deliveries or medical evacuations. Some 393,000 people are trapped in the enclave near Damascus, which has been besieged by the government since 2013. Medics say more than 500 people have been killed since the government intensified its bombardment nine days ago in an attempt to retake the enclave. At least six civilians were killed on Tuesday, the UK-based Syrian Observatory for Human Rights (SOHR) said - two of them during the five-hour ceasefire window. Russia's defence ministry, meanwhile, said rebels in the Eastern Ghouta "went on the offensive" during the pause, including attacking government positions in two settlements. As the truce broke down, France and Britain urged Russia to use its influence over Syrian President Bashar al-Assad to secure a 30-day ceasefire covering the whole country, as demanded by the UN Security Council on Saturday. "Russia is one of the only actors that can get the regime to implement the resolution," French Foreign Minister Jean-Yves Le Drian told his Russian counterpart Sergei Lavrov in Moscow. UK Minister of State for Europe and the Americas Sir Alan Duncan gave a similar message to the Russian ambassador in London. Fighting was reported by monitors including the UN after the Russian-ordered pause began at 09:00 (07:00 GMT) on Tuesday. The situation meant that humanitarian convoys could not go in, and medical evacuees could not come out, UN officials said. The World Health Organization said it had a list of more than 1,000 critically sick and wounded people who urgently needed to be evacuated. The situation in the Eastern Ghouta was comparatively calm early on Tuesday. 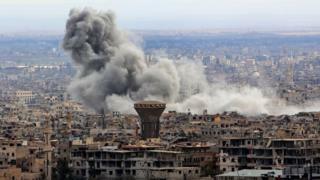 However, a man was killed by shellfire in the rebel-held town of Douma before the pause started, according to SOHR. The monitoring group also reported a number of violations in the five hours that followed, including air strikes by government planes and helicopters, and artillery shelling in the town of Jisrin that killed two people, including a child. Another child was reported to have been killed in Misraba after the truce ended. The Syrian state news agency, Sana, reported that "terrorists" had shelled the route of the humanitarian corridor leading to the government-controlled al-Wafideen checkpoint, which is north-east of Douma, and were using "human shields". Russian media said not a single civilian had left the besieged area as a result. The accusations of firing mortars was denied by the two Islamist rebel groups that dominate the Eastern Ghouta, Jaysh al-Islam and Faylaq al-Rahman, while the Syrian military said it had not carried out air strikes. Rebel factions also reiterated that jihadists from the al-Qaeda-linked alliance Hayat Tahrir al-Sham (HTS), who have a small presence in the Eastern Ghouta, had offered to be evacuated in exchange for a truce. The government and Russia say their bombing campaign is targeting HTS members in the enclave. Russia said Syrian government forces would "cease strikes on terrorists" from 09:00 until 14:00 local time (07:00-12:00 GMT) daily from Tuesday "with the aim of immediately saving the peaceful population". One "humanitarian corridor" to al-Wafideen had been prepared, with help from the Syrian Arab Red Crescent, to allow civilians to leave and the sick and wounded to be evacuated, it said. Residents would be informed via leaflets, text messages and videos, it added. Whether the daily "pause" is extended will "depend on how the terrorist groups behave," Kremlin spokesman Dmitry Peskov has said. Will the pauses allow aid to be brought in? France's foreign minister said it was vital that humanitarian aid was delivered, but aid organisations - including the International Committee of the Red Cross - argue the time provided by the Russian initiative is not nearly enough. A tightening of the government's siege since November has led to the exhaustion of food supplies and extremely inflated prices inside the Eastern Ghouta. Almost 12% of children under five years old are acutely malnourished - a level the UN says is unprecedented in Syria. There are also severe shortages of medical supplies, with doctors forced to treat severely injured patients without general anaesthetic drugs, intravenous antibiotics, blood bags and clean bandages. Humanitarian organisations say they need to be sure any truces are taking effect on the ground before sending in aid workers and vehicles. 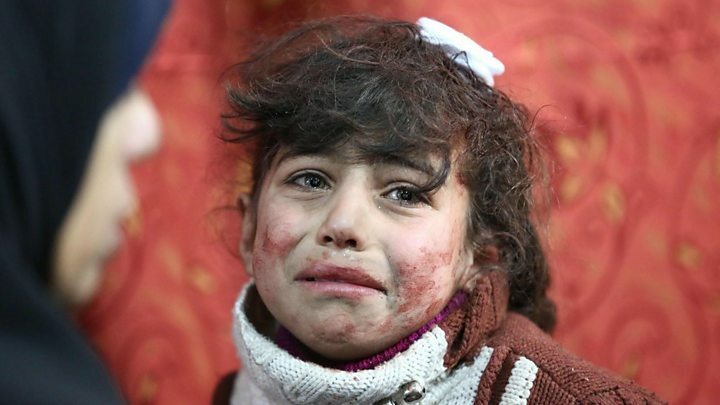 Dr Mohamad Katoub, a Turkey-based doctor with the Syrian American Medical Society (SAMS), which supports hospitals in the Eastern Ghouta and other rebel-held areas, told the BBC: "We don't believe that this truce will bring any benefits for the civilians inside Eastern Ghouta. Five hours is not enough to do anything." Will people be able to get out during the pauses? Firas Abdullah, a journalist for the pro-opposition Ghouta Media Center who lives in Douma, told the BBC on Tuesday that it was far too dangerous to venture outside, let alone try to reach the al-Wafideen checkpoint. "I went outside but only for a while," Firas Abdullah said. "After half a minute of this ceasefire, shells were dropped. Even if anyone tries to leave, he will be shot by the snipers of the regime checkpoint." Al-Wafideen has long been the formal point for people to enter and exit Eastern Ghouta. However, only a small proportion of the population - public sector employees and males over 40 - were permitted to leave before the government siege was tightened, according to Reach Initiative, which is monitoring the humanitarian situation there. Women and children were reportedly forbidden by rebel groups from leaving for security reasons. Reach said risks included sniper fire, landmines, shelling, verbal and physical harassment, detention and, in the case of women, sexual harassment, humiliating inspections and beatings.